Dusan Djukaric lives and works in Belgrade. 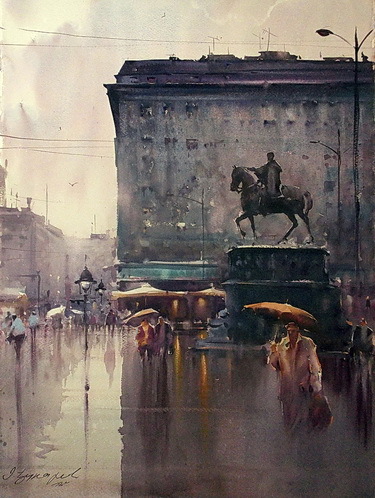 Very respected and esteemed master of watercolor painting, who dominates the atmosphere of the painting with ease, equally successful in all motifs: city and genre scenes, marines, nudes, landscapes. He paints the world and events around us, introducing us to the great mystery of watercolor painting, the most difficult panting discipline. Member of the Association of Applied Arts Artists and Designers of Serbia.